Aspirin appears to improve survival when taken at the time of embolization of hepatocellular carcinoma, possibly by reducing liver inflammation and thus improving liver function. The figure below shows survival after transarterial embolization of HCC patients taking aspirin (blue curve) versus not taking aspirin (red curve). p=0.0008. There was no difference in AJCC stage, Child Pugh score, etiology of underlying liver disease, ECOG performance status, Charlson comorbidity index, prior sorafenib, prior liver resection, or selectivity of the embolization for patients taking versus not taking aspirin. 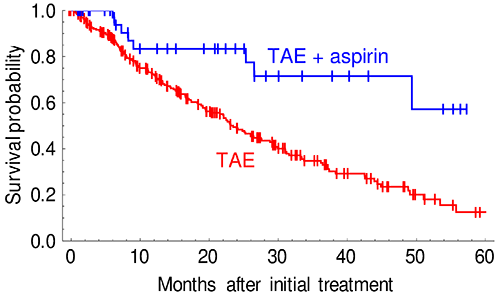 Aspirin was not associated with any difference in response or time-to-progression, thus arguing against a direct anti-tumor effect. 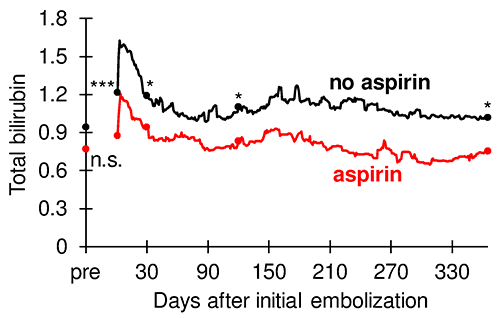 However, patients taking aspirin had improved liver function tests after embolization. The figure below shows average bilirubin before and after initial embolization of HCC. Although the differences in liver function tests in the aspirin and non-aspirin groups were small, standard biochemical liver function tests are relatively insensitive to early cirrhotic changes, and small changes in biochemical liver function tests might underestimate the degree of liver injury after embolization. Improved liver function in the aspirin group was persistent for at least one year post-embolization, and the aspirin patients were more likely to remain candidates for additional locoregional therapy. T-test comparing aspirin and non-aspirin groups: n.s. (p > 0.05), * (p = 0.05), ** (p = 0.01), *** (p = 0.001). Boas FE, Brown KT, Ziv E, Yarmohammadi H, Sofocleous CT, Erinjeri JP, Harding JJ, Solomon SB. (2019) "Aspirin is associated with improved liver function after embolization of hepatocellular carcinoma." AJR. In press. Boas FE, Ziv E, Yarmohammadi H, Brown KT, Erinjeri JP, Sofocleous CT, Harding JJ, Solomon SB. (2017) "Adjuvant medications that improve survival after locoregional therapy." Journal of Vascular and Interventional Radiology. 28(7): 971-977.